Well, it’s the first of September. Which, as you may or may not know, means two things. Number one: I am officially 25 years old. Number two: I survived the first real milestone of my culinary education – the midterm. Whew! What a week. A quarter century followed by a quartered chicken. Or it would have been, if I’d been assigned the roast chicken for the midterm. I actually ended up getting the skate à la grenobloise (skate fillet with croutons, capers, lemon, and brown butter) and the apple tart. Which meant that, after a short written exam, I had three hours to: fillet a whole skate (if you’ve never done this, let me suggest right now that you don’t. Skate is pretty delicious – it tastes almost exactly like scallops, minus the awkward texture – but it’s covered in slime and spikes and, overall, not a fun fish to have to break down. Especially under a time crunch. I’m just saying); make a batch of buttery croutons; turn four potatoes into twelve perfect little cocottes and then boil them until tender; brown the skate fillets in clarified butter; throw together a quick brown butter sauce with lemon and capers; mix up a batch of pâte sucrée; roll it out; fill it with apple compote and perfectly sliced apples; bake and cool the apple tart; glaze it; slice it; whip up a batch of soft, pillowy chantilly (whipped cream); plate both dishes and have them out at 1:06 and 1:48, respectively. And breathe. The good news is I think I passed. So I live to see the level 4 kitchens! And another day at 25. Yeesh. I suppose it’s a nice, solid, round number. I think I’ll stick with it for awhile… at least a year, anyway. Here you go – a classic apple tart. Very french, and very delicious. The best part? I will not be timing you. First, make the dough. Sift together the flour, sugar and salt in a bowl. Mix the cold, cubed butter into the dry ingredients using two forks or clean fingertips, until the butter is incorporated and the mixture has a sandy texture. Form a well in the butter-flour mixture and add the egg/water mixture into the well. Begin to combine the liquid into the flour-butter mixture, being careful not to overwork the dough (overworked dough leads to tough, heavy crust). If the dough seems too dry (if it’s too flaky and won’t stick together), add a few drops of ice-water (only a few small drops at a time!) until it comes together. Gather the dough, form it into a flat disc, and wrap in plastic wrap. Chill in the refrigerator at least 30 minutes. Meanwhile, make the compote. Put the Granny Smiths, sugar, water, and lemon juice in a sauté pan over medium-low heat, and cook slowly under a parchment paper lid, until the apples are soft and have exuded their juices. Remove the parchment and cook the apples until most of the liquid has evaporated. Place compote in a bowl and chill immediately in the refrigerator or freezer. Preheat the oven to 425ºF. When the dough is thoroughly rested and chilled, roll it out on a floured surface and gently press it into an 8-inch tart pan. Spread the cold apple compote in an even layer on the bottom of the pastry shell. Peel the Golden Delicious apples, cut them in half, and core them. Slice the apples in very thin slices horizontally, and arrange them decoratively on top of the apple compote, making sure to place the slices very close together (the apples will shrink in the oven, so be generous with the little slices and be sure to overlap them on top of each other). Brush or pour the melted butter over the tart, and bake it in the 425º oven for 10 minutes. Lower the heat to 350ºF and bake for an additional 50-60 minutes. When it’s ready, the apples should be soft and brown on the edges, and the pastry should be golden brown. Once the tart is finished, mix the apricot jelly and water together and heat on the stovetop until runny. Brush the apricot glaze over the warm tart, and let the tart cool before slicing. Serve with a dollop of whipped cream or some cool vanilla ice cream. 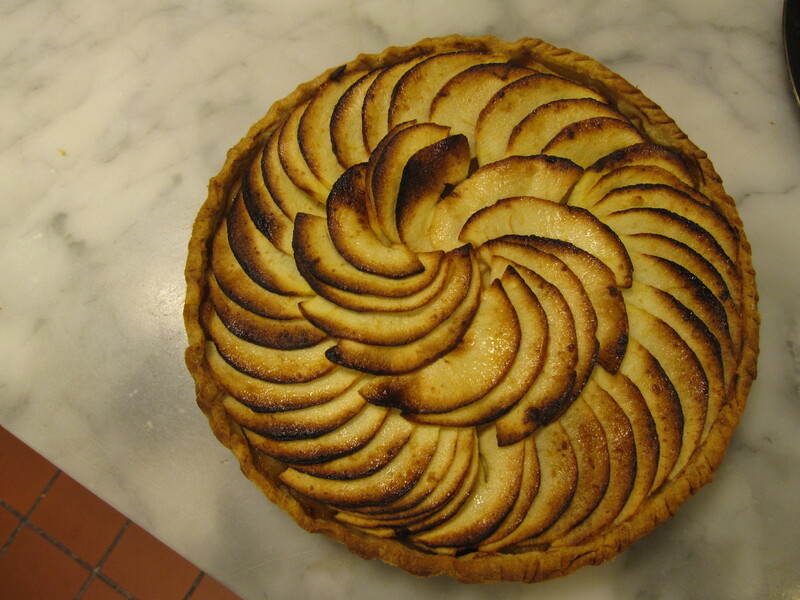 That apple tart is by far the best looking tart of any kind that I've ever seen. If I didn't have a daughter who knows how to make these tarts, I try making one myself. Really.